Plasma light is one of the most efficiency light sources around, at up to 100 lumens per watt under photopic (well-lit or daytime) conditions, over 150 lumens per watt under mesopic (twilight) conditions, and in excess of 200 lumens per watt in scotopic (dark or nighttime) conditions. Not even LEDs can provide such high efficiencies at high output levels with ideal color reproduction. Metal halide lamps typically deliver up to 100 lumens per watt in photopic conditions, but deliver only 120 lumens per watt under mesopic conditions and 140 lumens per watt under scotopic conditions. This is only under ideal circumstances, unlike plasma lamps, they'll deliver substantially less after 3000 hours of operation whereas plasma lamps will be offering close to the same efficiencies after 50000 hours of continuous use, besting induction lamps as well. 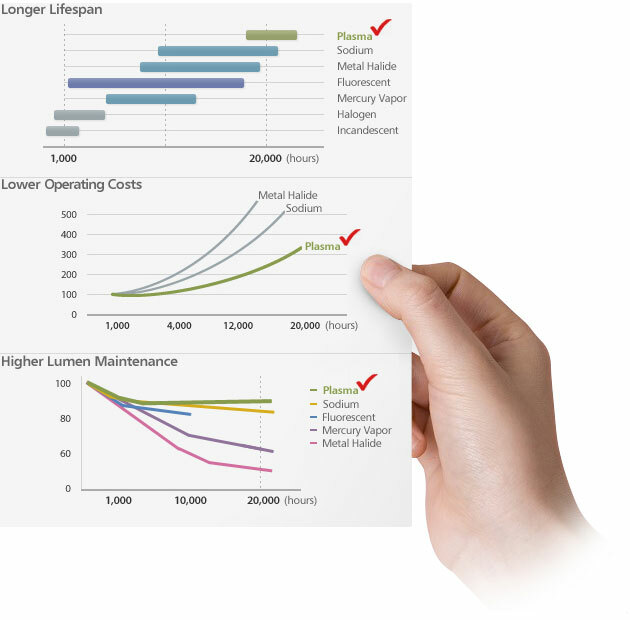 The higher efficiencies directly translate to lower operating costs over time. In addition, metal halide lamps will require several bulb replacements, which means labor and equipment costs to get the job done. Imagine the savings in large installations, it's tremendous!